Professor of International Economics at the Graduate Institute in Geneva, Charles Wyplosz explains why the Ukraine-Russia deal involves politics as much as economics. However, the economics of the deal will eventually lead to problems for one or both. As the price to deter a westward move of Ukraine, Russia has made an offer that the Ukrainian president has found impossible to turn down, if he ever contemplated seriously tying his country to the EU. 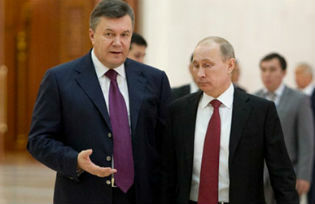 This is generally hailed as a master coup by President Putin and a great relief for President Yanukovych. In fact, this coup is likely to end in tears for both countries. For many years now, Ukraine has been on a lifeline from the IMF. Severe policy mismanagement has left the country teetering on the brink of default. IMF programmes have been on and off, as commitments were not kept. Most recently, Ukraine has been negotiating a new loan but never closed the deal because it was unwilling to accept the associated policy conditions. The Russian loan means that Ukraine does not have to agree to an IMF programme, at least for the time being. The first aspect of this deal is that it undermines the IMF. When Japan proposed to set up an Asian Monetary Fund (AMF) during the Asian crisis of 1997, the idea was promptly scuttled because it was perceived as a competition to the IMF. The fear was that the AMF would provide loans at much less demanding conditions than the IMF. Viewed from Washington, this meant too soft conditions. Since then, the IMF has admitted that its (initial) conditions were excessively restrictive, making ex post the case for an AMF stronger. The perception now is that the Fund has learned its lessons. In fact, when the Europeans created their own European Monetary Fund, first with the temporary European Financial Stability Fund, then with the permanent European Stability Mechanism (ESM), the IMF criticised the programmes as being too restrictive. It is not known what economic conditions Russia has requested but a safe bet is that there is none, only political conditions. Thus Russia has acted as a highly politicised IMF, in effect getting the IMF out of the picture and allowing Ukraine to carry on with its disastrous economic policies. To say the least, it is surprising that one of the Fund’s main shareholders, with its own seat on the Executive Board, so callously undermines the institution. Just imagine what would happen if other governments would offer loans without conditions to countries that are deeply mismanaged and refuse to change their ways as requested by the IMF. The Bretton Woods agreements were designed to create a multilateral world where countries in difficulties benefit from international support and (generally) wise advice. Bilateral deals like the Russia-Ukraine one run against the spirit of Bretton Woods, an arrangement that has mostly worked well for nearly seven decades. The second aspect is that the economic consequences of the deal will be dire for Ukraine and, in a smaller way, for Russia. Deficit spending, heavy government interventions, graft and more will continue. This will further deteriorate the Ukrainian economy. Sooner or later, Ukraine will need more money. Russia will either have to provide another, possibly bigger loan, or let the shoe drop. If another loan is forthcoming, on account of Ukrainian compliance with the political conditions, yet another one will be needed further down the path, again and again. When Russia gets tired of this process, Ukraine will have no choice but to default on the Russian loans. This will be a blow to the Ukrainian economy and to Russia. There can be no happy end when one country helps another one defy basic economic management principles. The third aspect concerns a specific aspect of Ukrainian mismanagement and Ukraine-Russia relationships. Ukraine used to buy oil and gas from Russia at close to market prices – through opaque and highly corrupt arrangements – while domestic prices were kept low for the usual political reasons. One of the conditions set by the IMF was that the Ukrainian authorities stop subsidising oil and gas. The new deal now includes Russia’s agreement to sell oil and gas to Ukraine at significantly below market prices. This provides great immediate relief to the cash-strapped Ukrainian government, of course. It also creates a deep political dependence on the Ukrainian authorities vis à vis Russia. The costs of the deal are for Russia, whose government will have to compensate its oil and gas exporters. This may be possible at a time when the oil and gas markets are rather depressed. Eventually, however, global demand will rise again, pushing up prices and increasing the costs for Russia. Here again, it is hard to imagine that Russia will be willing to continue indefinitely to heavily discount its oil and gas exports to Ukraine. Eventually it will pull the plug, after having suffered losses. When that happens, Ukraine will be in deep crisis.